This class builds the dependence graph for the instructions in a loop, and attempts to schedule the instructions using the SMS algorithm. Definition at line 109 of file MachinePipeliner.h. Definition at line 197 of file MachinePipeliner.h. References llvm::TargetSubtargetInfo::getSMSMutations(), llvm::MachineFunction::getSubtarget(), and llvm::MachinePipeliner::MF. Definition at line 275 of file MachinePipeliner.h. Apply changes to the instruction if needed. The changes are need to improve the scheduling and depend up on the final schedule. Definition at line 3074 of file MachinePipeliner.cpp. References llvm::MachineFunction::CloneMachineInstr(), llvm::SMSchedule::cycleScheduled(), llvm::DenseMapBase< DenseMap< KeyT, ValueT, KeyInfoT, BucketT >, KeyT, ValueT, KeyInfoT, BucketT >::end(), llvm::DenseMapBase< DerivedT, KeyT, ValueT, KeyInfoT, BucketT >::find(), llvm::TargetInstrInfo::getBaseAndOffsetPosition(), llvm::MachineOperand::getImm(), llvm::MachineInstr::getOperand(), llvm::MachineOperand::getReg(), llvm::MachinePipeliner::MF, llvm::MachineOperand::setImm(), llvm::SUnit::setInstr(), llvm::MachineOperand::setReg(), llvm::SMSchedule::stageScheduled(), and llvm::MachinePipeliner::TII. Definition at line 279 of file MachinePipeliner.h. Clean up after the software pipeliner runs. Definition at line 469 of file MachinePipeliner.cpp. References llvm::MachineFunction::DeleteMachineInstr(), llvm::ScheduleDAGInstrs::finishBlock(), I, and llvm::MachinePipeliner::MF. 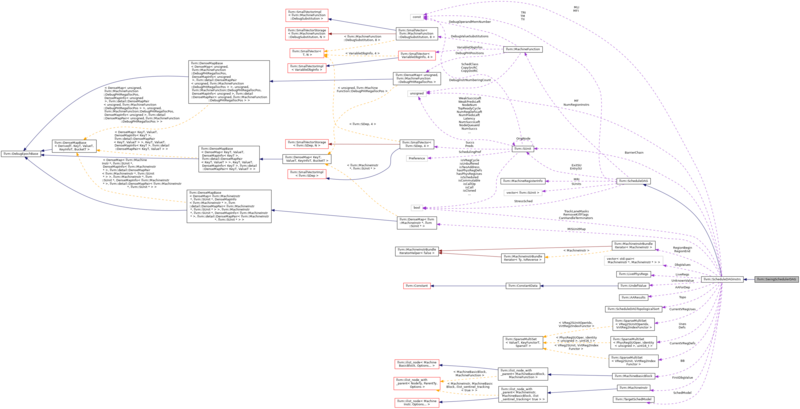 Attempt to fix the degenerate cases when the instruction serialization causes the register lifetimes to overlap. For example, p' = store_pi(p, b) = load p, offset In this case p and p' overlap, which means that two registers are needed. Instead, this function changes the load to use p' and updates the offset. Definition at line 3651 of file MachinePipeliner.cpp. References llvm::MachineFunction::CloneMachineInstr(), llvm::DenseMapBase< DenseMap< KeyT, ValueT, KeyInfoT, BucketT >, KeyT, ValueT, KeyInfoT, BucketT >::end(), llvm::DenseMapBase< DerivedT, KeyT, ValueT, KeyInfoT, BucketT >::find(), llvm::TargetInstrInfo::getBaseAndOffsetPosition(), llvm::MachineOperand::getImm(), llvm::SUnit::getInstr(), llvm::MachineInstr::getNumOperands(), llvm::MachineInstr::getOperand(), llvm::MachineOperand::getReg(), llvm::MachineOperand::isReg(), llvm::MachineInstr::isRegTiedToUseOperand(), llvm::MachineOperand::isUse(), llvm::MachinePipeliner::MF, llvm::MachineOperand::setImm(), llvm::SUnit::setInstr(), llvm::MachineOperand::setReg(), and llvm::MachinePipeliner::TII. Definition at line 216 of file MachinePipeliner.h. Definition at line 213 of file MachinePipeliner.h. Definition at line 223 of file MachinePipeliner.h. The distance function, which indicates that operation V of iteration I depends on operations U of iteration I-distance. Definition at line 253 of file MachinePipeliner.h. References llvm::SDep::Anti, llvm::SUnit::getInstr(), llvm::SDep::getKind(), llvm::MachineInstr::isPHI(), and MI. Definition at line 232 of file MachinePipeliner.h. Definition at line 267 of file MachinePipeliner.h. References llvm::DenseMapBase< DenseMap< KeyT, ValueT, KeyInfoT, BucketT >, KeyT, ValueT, KeyInfoT, BucketT >::end(), and llvm::DenseMapBase< DenseMap< KeyT, ValueT, KeyInfoT, BucketT >, KeyT, ValueT, KeyInfoT, BucketT >::find(). Definition at line 220 of file MachinePipeliner.h. The maximum unweighted length of a path from an arbitrary node to the given node in which each edge has latency 0. Definition at line 227 of file MachinePipeliner.h. The maximum unweighted length of a path from the given node to an arbitrary node in which each edge has latency 0. Definition at line 236 of file MachinePipeliner.h. Definition at line 210 of file MachinePipeliner.h. Since the DAG doesn't contain cycles, we represent a cycle in the graph using an anti dependence from a Phi to an instruction. Definition at line 243 of file MachinePipeliner.h. References llvm::SDep::Anti, llvm::SUnit::getInstr(), llvm::SDep::getKind(), llvm::SDep::getSUnit(), llvm::MachineInstr::isPHI(), and llvm::Sched::Source. Referenced by llvm::SMSchedule::computeStart(), and multipleIterations(). Return true for an order or output dependence that is loop carried potentially. A dependence is loop carried if the destination defines a valu that may be used or defined by the source in a subsequent iteration. Definition at line 3111 of file MachinePipeliner.cpp. References assert(), llvm::computeDelta(), D, llvm::tgtok::Def, llvm::TargetInstrInfo::getIncrementValue(), llvm::SUnit::getInstr(), llvm::SDep::getKind(), llvm::TargetInstrInfo::getMemOperandWithOffset(), getPhiRegs(), llvm::MachineOperand::getReg(), llvm::TargetSubtargetInfo::getRegisterInfo(), llvm::MachineFunction::getSubtarget(), llvm::SDep::getSUnit(), llvm::MachineInstr::hasOrderedMemoryRef(), llvm::MachineInstr::hasUnmodeledSideEffects(), llvm::SDep::isArtificial(), llvm::MachineOperand::isIdenticalTo(), llvm::MachineInstr::isPHI(), llvm::MachineInstr::mayLoad(), llvm::MachineInstr::mayStore(), llvm::MachineInstr::memoperands_begin(), llvm::MachinePipeliner::MF, MRI, llvm::SDep::Order, llvm::SDep::Output, SI, std::swap(), SwpPruneLoopCarried, llvm::MachinePipeliner::TII, TRI, and llvm::MemoryLocation::UnknownSize. Referenced by llvm::SMSchedule::computeStart(), and swapAntiDependences(). 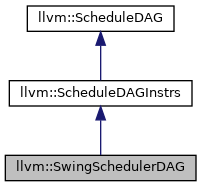 We override the schedule function in ScheduleDAGInstrs to implement the scheduling part of the Swing Modulo Scheduling algorithm. Definition at line 378 of file MachinePipeliner.cpp. References llvm::SmallVectorTemplateCommon< T, typename >::begin(), llvm::dbgs(), llvm::Pass::dump(), llvm::SmallVectorTemplateCommon< T, typename >::end(), llvm::Pass::getAnalysis(), llvm::SMSchedule::getMaxStageCount(), I, LLVM_DEBUG, llvm::stable_sort(), SwpIgnoreRecMII, SwpMaxMii, and SwpMaxStages.